My Torongo DNA match isn't responding. I can see that he has logged into Ancestry the last couple of days, where I left my message for him, so he either hasn't noticed it or he's deliberately ignoring it. While that's on hold, I keep getting my brain in a tangle, wondering if I'm barking up the wrong tree in my hunt for PM. Maybe I've made a stupid mistake, and PM isn't in the Doyle family at all. I always find diagrams helpful when I'm trying to nut things out, so I made one, using a screen shot of part of my Ancestry tree and the wonderful Windows Ink program that comes hidden inside Windows 10. Click to enlarge it. 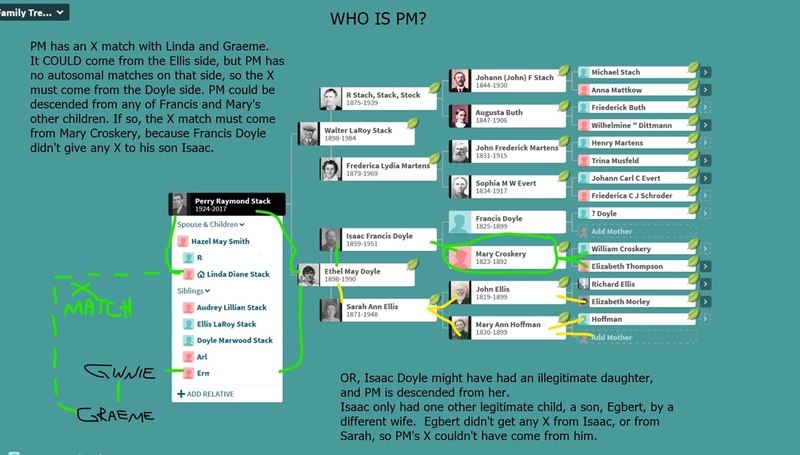 It surprised me when I realized that if PM is a Doyle, he/she must have got his/her X DNA either from the Croskery line of the family, or from an illegitimate daughter of my great-grandfather Isaac. If that's the case, I'm scrambling in the dark, with no knowledge of her maiden name or her married name. Not that I know of any illegitimate children Isaac might have had, but he was a bit of a loose cannon, so who knows what he got up to? He spent his latter years hundreds of miles away from his wife, fawning over the evangelist Amiee Semple McPherson - not that I think she might have been the mother of his love child - he probably never even spoke to her. I didn't get any X DNA from my father's father (because men don't give any X DNA to their sons, only to their daughters), so all the X DNA I got from my father had to come from his mother. Therefore, the match must be in one of her lines - Ellis or Doyle. Of course, Graeme could have got some X DNA from my father's father, because he's descended from one of his daughters - but because I couldn't, that's obviously not where the match is. Isaac's only other known child is a son, Egbert, by Isaac's first wife. Egbert would not have any X DNA from Isaac (because men don't give any X DNA to their sons, only to their daughters - forgive me for saying that multiple times, but it's a very important thing to remember), nor, obviously from my great-grandmother Sarah, who was not Egbert's mother. So Isaac's X DNA is out of the running as the source of the match, unless he had another daughter that we don't know about. If there's no mystery daughter (and I fervently hope there isn't!) PM could be descended from one of Isaac's siblings. His sisters would have X DNA from their father Francis (because men don't... etc), but the fact remains that neither Graeme nor I could have got any from him, so the X DNA we both share with PM must have come, not from Francis, but from his wife Mary Croskery. Make sense? That was a rather large nutshell, wasn't it. Sorry about that. Sadly, I know almost nothing about Mary Croskery, so I hope PM isn't descended from one of her siblings! And the possibility remains that PM, despite having no autosomal DNA matches with any of the 30 or so Ellises that I match, is in fact, an Ellis. God forbid. I'm in Touch with Torongos!